If your guinea pig starts sniffling, a visit to the vet is in order. 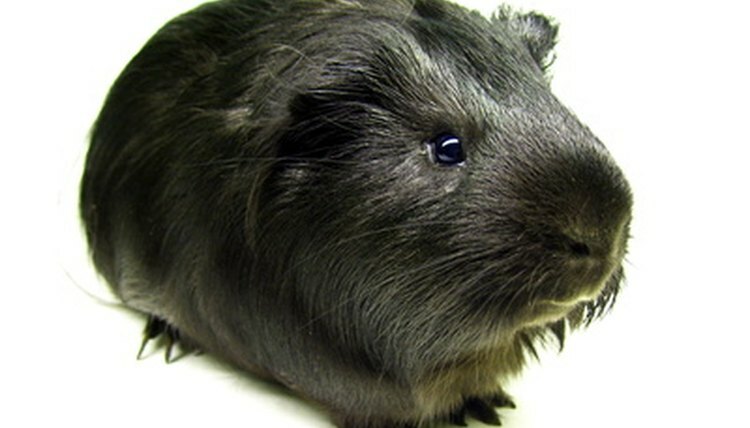 Guinea pig colds can quickly become pneumonia, the No. 1 cause of death for guinea pigs according to The Merck Veterinary Manual. You can't 100 percent guarantee your little guy won't come get pneumonia, but you can take preventive measures. Guinea pig pneumonia usually results from bacterial infection. The most common culprit is Bordetella bronchiseptica, which causes kennel cough in canines. Other sources of infection include Streptococcus pneumoniae, Staphylococcus aureus, Klebsiella pneumoniae and Citrobacter freundii. Whatever the pathogen, your guinea pig will need intensive nursing to survive. If your guinea pig suffers from pneumonia, it'll be pretty obvious that something's wrong with him. Symptoms include nasal discharge, difficulty breathing, lethargy and sneezing; he might stop eating and run a fever. Conjunctivitis, also known as pinkeye, is another sign of pneumonia in guinea pigs. His eyes will appear inflamed, or pink, with swelling and possible discharge. Guinea pigs with pneumonia might suffer from middle ear infections, whose symptoms include neck twisting, circling to one side, unsteady movement and rolling. If you or your dog or cat came down with pneumonia, the doctor or vet would almost certainly prescribe antibiotics to fight the infection. That's not the case with guinea pigs. Cavies, another name for guinea pigs, are sensitive to antibiotics, and administration of these drugs is as likely to harm as cure them. Your vet might try antibiotic therapy on a sick cavy and will then keep a close eye on his digestive tract. Antibiotics can wreak havoc on a guinea pig's gastrointestinal system, so if your pet experiences diarrhea your vet will take him off the drug. Treatment therefore often consists primarily of supportive care. Your vet might give your pet intravenous fluids if he's dehydrated, along with vitamin C supplementation. If your guinea pig won't eat, force-feeding might be necessary. Guinea pigs don't do well in cold weather, which is when they're most likely to come down with colds or pneumonia. If you keep your pet's cage outside during warmer months, bring it indoors long before the nights get chilly. Keeping your cavy in the house all the time lessens the possibility of his becoming affected by weather extremes. Keep him away from drafts. Make sure he's fed a healthy diet to boost his immune system, including plenty of vitamin C. Guinea pigs can't manufacture this essential vitamin in their own bodies, so they need constant outside sources. While most commercial guinea pig foods contain sufficient amounts, you might want to supplement your pet's diet with fruits and veggies full of vitamin C. These include strawberries, cauliflower, melon and brussels sprouts, and dandelion greens from your lawn if you don't use pesticides. Your pet should have good quality timothy or grass hay available at all times, along with fresh, clean water.